“Have you decided what kind of animal you would like to be if you don’t make it?” asks The Hotel Manager (Olivia Colman). “A lobster,” replies David (Colin Farrell). “A lobster is an excellent choice,” she responds. A lobster is an excellent choice for the plight of the hopeless romantic personified in animal form. A lobster makes for a messy meal, but also a romantic one, especially if one wants to butter up that special someone with a delectable treat. The year’s freshest catch so far comes in this bizarre and wonderful new film from Greek director Yorgos Lanthimos. The biggest surprise of the film is that the director of the subversive and merciless Dogtooth delivers one of the deepest and most honest love stories in recent memory as David searches for love in the hostile fighting ground of The Hotel and catches the eye of a short-sighted woman (Rachel Weisz). The pair evades the rules of dystopian despair like Katniss and Peeta, but a deep and dark layer of cynicism underlies the sweetness of the film. Art house audiences with rumbly bellies for dystopian fare can satiate themselves with the oh-so-delicious The Lobster, which is a bold, dark, and wickedly funny arthouse response to The Hunger Games. As teen-targeted franchises see youngsters pick one another off in games of battle royal, The Lobster unleashes a diabolically droll hunt in an uncertain future in which the line between humans and animals is very fine. Colin Farrell gives a surprising and disarmingly funny performance as David, a meek and pudgy man who decides that his spirit animal is a lobster when his time comes to pick a member of the animal kingdom to be his potential future. Like a lobster waiting for a pot to boil, David is off to the races, running for his life in a bizarre getaway at The Hotel, a resort/death camp in the Irish countryside. The Lobster gives the viewer enough details to discern the rules of this strange compound in which humans have a few weeks to find a partner in between rounds of hunting fellow humans, while people who fail to find a match become animals set forth into the wild. The Lobster withholds enough information, too, to keep the atmosphere surreal and ambiguous with flavours as rich as a newly cracked shellfish dipped in garlic butter. Licking her lips is The Hotel’s manager, who demurely explains the rules (which are quite extensive) by which David may shorten or extend his stay. Colman is a fantastic presence as the matriarch of dystopian destiny who drolly explains the fates that await the “guests” in dry, polite diction. It’s a great supporting turn that highlights the dark funnybone of The Lobster in which deadpan delivery fuels both the humour and rich dystopian atmosphere. Her dance scene is a hoot. Lanthimos brings the same peculiar eye for human behaviour one sees in Dogtooth as The Lobster uses people, places, and space with dry cynicism. The actions all seem a little off-kilter, a little eccentric, and a little bit kooky, and the bizarre interactions between the Hotel Guests and the Outsiders offers black humour and futuristic dread. As animals (failed humans) trot around the frame as camels, flamingoes, or loyal dogs, The Lobster brings a uniquely pessimistic love story to the screen. The Lobster is reminiscent of Kazuo Ishiguro and Alex Garland’s Never Let Me Go as it creates a disquieting vision of the future using only dialogue and atmosphere. Weisz narrates the film as the Short-Sighted Woman recounts the story of the man she loved, and the film adopts the tone of a fable as if tortoises and hares are harbingers for romance. The actors deliver their lines with nary a hint of humanity as the characters live in a world void of feeling, emotion, or love. Matchmaking at the hotel functions akin to basic yes or no matches on Plenty of Fish as prospective partners pair up based on common bonds like short-sightedness, nosebleeds, or, most humorously, a heartless disregard for human life. In The Forest amongst The Outsiders, David and the Woman find short-sightedness as an entry point for romance as they bond over a private language, dance to Nick Cave and Kylie Minogue, and find that true relationships thrive through shared experiences and mutual respect. As David tries to force prospective partners into suitable couples at The Hotel and then finds a genuine, intimate connection with The Short-Sighted Woman in The Forest outside The Hotel, The Lobster offers a profound meditation on the soul as David and the woman negotiate the rules of a world that demands coupling and forbids intimacy. The film deftly—and most significantly—challenges the status quo of coupling. The nuclear family is akin to punishment in The Lobster, for children are noisy, whiny nuisances that serve as Band-Aids for ill-suited couples. (A scene in which David bluntly kicks a child is bound to be the moment where some viewers fall head over heels in love with The Lobster.) None of the couples in The Lobster endure, as David discovers when the bands with the outsiders who lurk in The Woods and plan to destabilise The Hotel by sabotaging the relationships that the Manager values all the hallmark for success. The film presents coupling a security and a gift, but it’s also a burden and a lie. 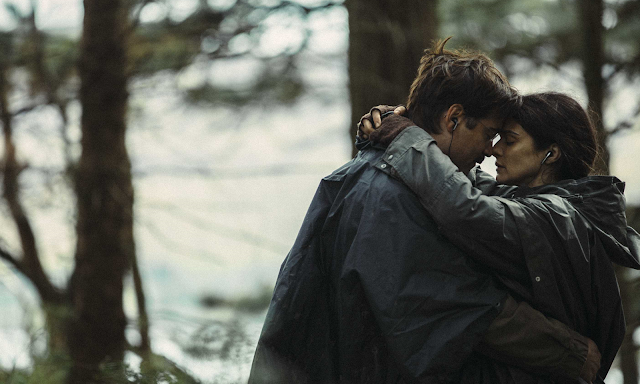 The Lobster is now playing in Toronto at the Canada Square and TIFF Bell Lightbox. It opens in Ottawa at The ByTowne on April 8. and The Mayfair on April 16.